(June 7, 2006) - Family, Friends, Members of the Religious Community, Members of the Press, and my fellow Americans—thank you for coming today. 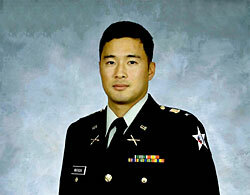 Lt. Ehren Watada during recording of statement, June 6, 2006It is my conclusion as an officer of the Armed Forces that the war in Iraq is not only morally wrong but a horrible breach of American law. Although I have tried to resign out of protest, I am forced to participate in a war that is manifestly illegal. As the order to take part in an illegal act is ultimately unlawful as well, I must as an officer of honor and integrity refuse that order. Normally, those in the military have allowed others to speak for them and act on their behalf. That time has come to an end. I have appealed to my commanders to see the larger issues of our actions. But justice has not been forthcoming. My oath of office is to protect and defend America’s laws and its people. By refusing unlawful orders for an illegal war, I fulfill that oath today. copyright © 2006 平和志向法律屋　「DANZO」。 all rights reserved.